This pretty Snowflake Obsidian Power Bead Bracelet has a marbled pattern made by the inclusions of the white mineral phenocryst, running through the black obsidian which is what gives it the distinctive pattern resembling a snowflake when polished. These pretty beads are strung on elastic so that they will fit most any size wrist. This is a fun and pretty bracelet to wear! The average diameter of the bracelets are 3.5". Obsidian is a volcanic stone with a high luster to it, so it is both good for grounding and also for inner reflective work. Snowflake obsidian is said to enhance the ability to realign patterns in our lives with those which will better serve us. According to Melody it is a stone of "purity" helping to balance mind, body & spirit. 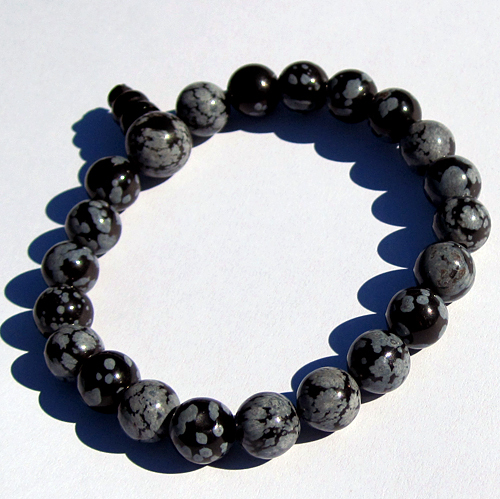 As far as I can tell, the healing power of beauty itself is enough reason to wear this lovely snowflake obsidian bracelet. Wear it in good health & joy! This stone can be useful in detatching from old energies, encouraging new methods to achieve one's goals and assisting in issues of self love. All in all, a wonderful and beautiful stone to wear or keep in your pocket! Note: weight above is shipping weight. Actual weight of each bracelet averages .65 oz. Each piece is unique and may vary slightly in appearance. Each piece is guaranteed to be beautiful and to meet with your complete satisfaction.